UK shares sank while the pound soared after the Bank of England hinted at a possible rate rise in "the coming months". The Monetary Policy Committee (MPC) kept UK rates unchanged at 0.25% after its latest meeting, as expected. But the pound jumped by more than a cent and a half against the dollar to $1.3391 as markets digested the minutes of the MPC's meeting. 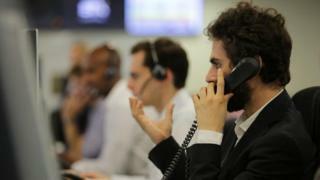 The FTSE 100 share index fell 84.31 points to 7,295.39. The FTSE often falls when the pound rises, as the stronger currency cuts the value of companies' overseas earnings when they are brought back to the UK. "The prospect of a November rate hike is now a real possibility, in our view," said Kathleen Brooks, research director at City Index. As well as surging against the dollar, the pound also jumped against the euro, rising by about one and half euro cents to 1.1269 euros. On the stock market, shares in Morrisons were one of the biggest fallers in the FTSE 100, down 5.1%, even though its latest results indicated that the recent revival at the UK's fourth largest supermarket was continuing. Like-for-like sales climbed 3% in the six months to 30 July, while underlying profit rose almost 13% to £177m. But shares in Next jumped 13% after the High Street fashion chain raised its full-year sales and profit outlook thanks to "encouraging" trading in the past three months. The news overshadowed a near 10% drop in half-year profit. In the FTSE 250, shares in Spire Healthcare sank 18.6% after its half-year profits were hit by the legal settlement to compensate victims of rogue breast surgeon Ian Paterson. On Wednesday, the company said it had agreed to pay £27.2m into a £37m fund for the victims. The payment contributed to a 75% drop in in Spire's half-year profits to £8.9m.